Tudi zima je lahko izziv. Flamingo se je odločil, da pogleda še v kraje z nižjimi temperaturami. Le kaj ga tam čaka? Voščilnica je izdelana za nov izziv pri Colour Crazy Sponsorsko štampiljko Knitty Kitty Digis lahko dobite na TEJ povezavi. Fantastic! I love that your flamingo is traveling the globe for Christmas! Thanks for sharing the fun with us at Penny's! 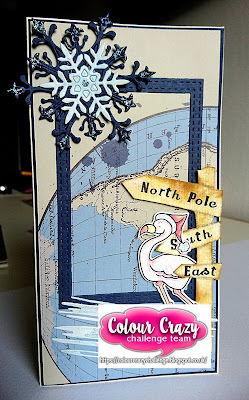 A lovely creation, thanks so much for joining in with our 'I Spy' theme at Stamping Sensations this month. This is so cute Thank you for sharing with us over here at "A Perfect Time To Craft" and best of luck with your entry. The snowflake is beautiful! The layout is such a creative idea. Hi Marjeta! Thank you very much for creating such a super project with Felicia! I love the idea of her traveling because of the weather! :) Thanks for entering all the challenges too, you hard work is appreciated. Very cute take on our challenge! Thanks for joining us at Stamping Sensations this month. Thank you soo much for taking part in our "Across the miles / Travel” challenge over at The Sketchy Challenges & good luck in the draw. Great card. 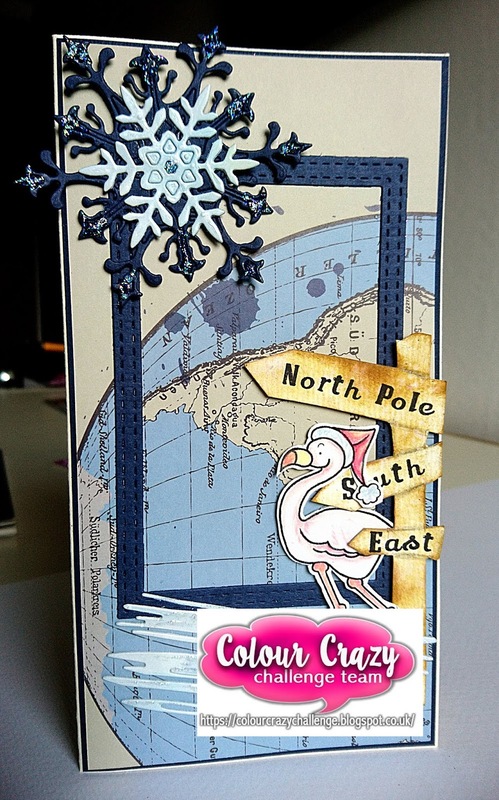 Thank you for joining Crafty Hazelnut's weekly Christmas card challenge. Hope to see you again next time. Cute card! Thanks for joining us at Scrappelyst.